Carbon materials (CMs) have great potential in industry due to their high electric conductivity, good chemical stability, and unique microstructure. Traditionally, CMs were prepared by the carbonization of low-vapor-pressure natural products or synthetic polymers. But they suffer from some distinct disadvantages, such as difficulty in tailoring the microstructures and chemical compositions of the obtained products, or complicated and slow polymerization processes. Until now, it has been a significant challenge to develop a low-cost, highly controllable method for preparing CM with desired constituents and structures at a large scale. 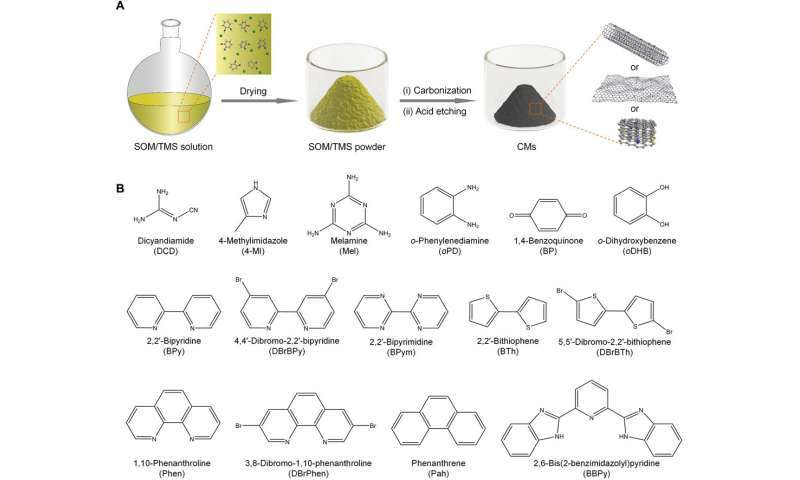 A research team led by Prof. Yu Shuhong and Prof. Liang Haiwei from the University of Science and Technology of China (USTC) proposes a simple method to prepare a series of functional CMs from small organic molecules (SOMs) by a transition metal-assisted carbonization process. This work was published in Science Advances titled "Transition metal-assisted carbonization of small organic molecules toward functional carbon materials." Small organic molecules (SOMs) as precursors for preparing CMs have some distinct advantages, such as common availability, relatively low cost, and diverse element species with various contents. Previous efforts on the transformation of SOMs into CMs relied on harsh synthesis conditions, e.g. pyrolysis in sealed reactors, chemical vapor deposition, or salt-melt-based ionothermal carbonization, due to the high volatility of SOMs at evaluated temperatures. To address this, the research group led by Prof. Yu Shuhong and Prof. Liang Haiwei developed a method of transition metal-assisted carbonization of SOMs. The transition metals can catalyze the preferential formation of thermally stable intermediate polymeric structures and thus avoid the direct sublimation of SOMs during the heating process, which guarantees the successful preparation of CMs with high carbon yield. Researchers have found that 15 SOMs and 9 TMSs can be employed as carbon precursors and catalysts, respectively, for preparing CMs. Besides, two hard templates can used in the method to enhance the porosity of obtained CMS. Research results indicate that the method is a simple, effective, and versatile method to prepare CMs. The prepared CM exhibited three different prominent microstructures (including bamboo-like multi-walled carbon nanotube, micrometer-sized nanosheets and irregular particles) that were highly dependent on the molecular structures of SOMs. Besides, the CMs possessed high specific surface areas, large pore volumes, abundant hetero-atoms as well as highly graphitic structures. As a result, the CM showed significant application potential for heterogeneous catalysis—e.g. selective oxidization of ethylbenzene and hydrogenation of nitrobenzene; and electrocatalysis, e.g. hydrogen evolution reaction and oxygen reduction reaction. This work opens a new window for the synthesis of CMs with desired constituents and structures.